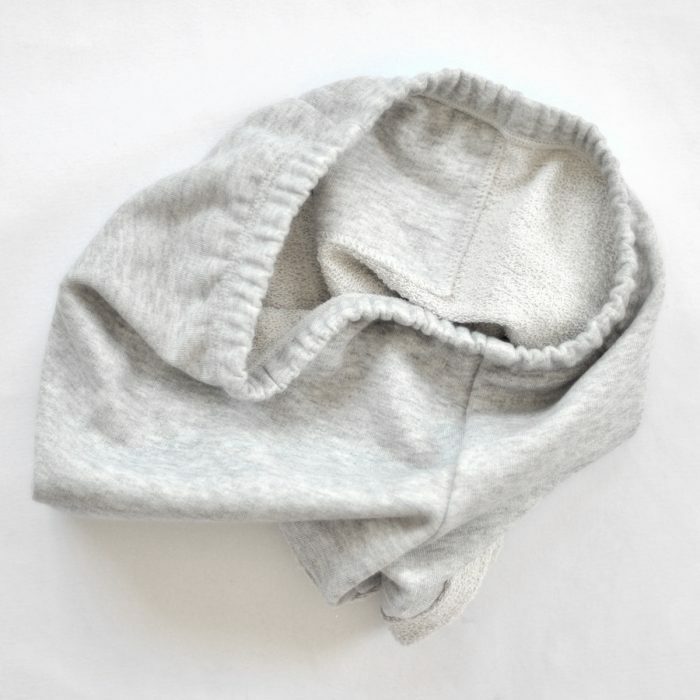 The Slouch Shorts are made in Brisbane from GOTS certified organic French Terry. Designed for active, busy kiddos because we believe kids should spend their days playing. 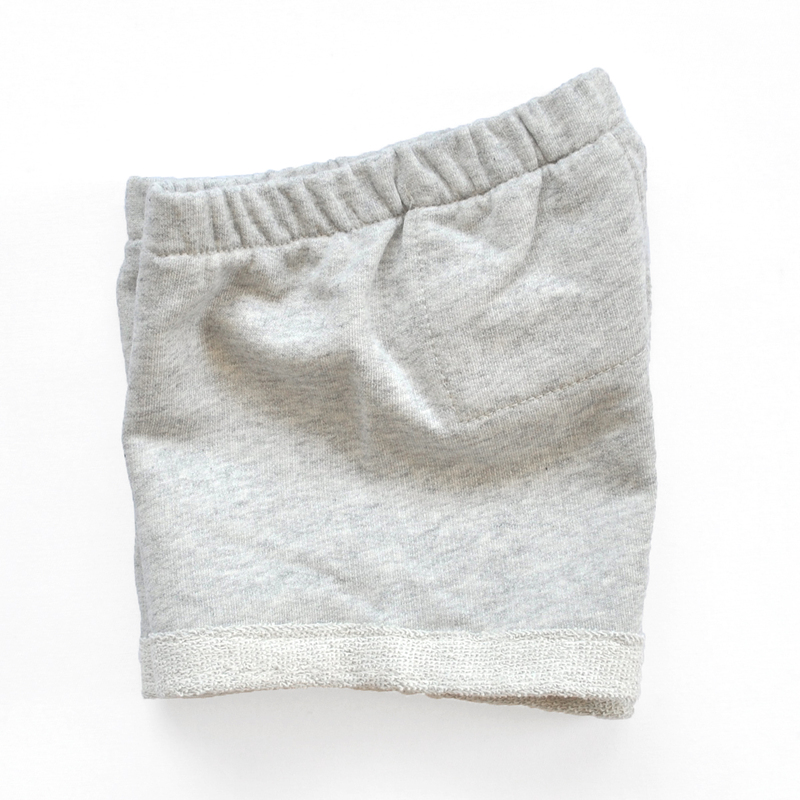 The softest, silkiest and most practical pair of shorts your little love will own. 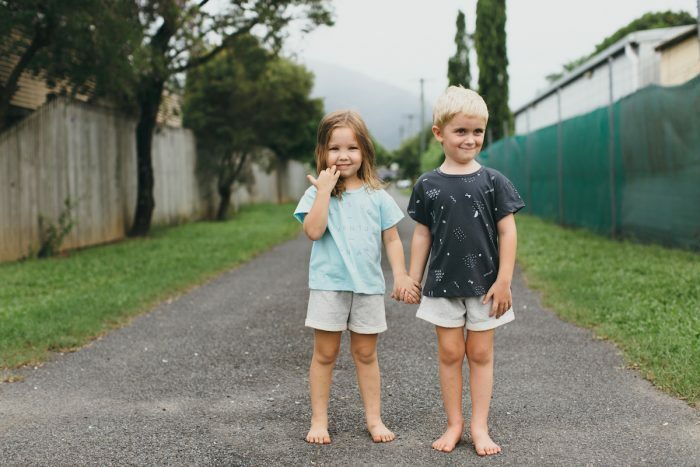 The Slouch Shorts are unisex in design and feature an above the knee length for active kiddos to go about their busy day of playing. The waist band features the softest, comfiest elastic possible and has been designed to roll over and sit flat. 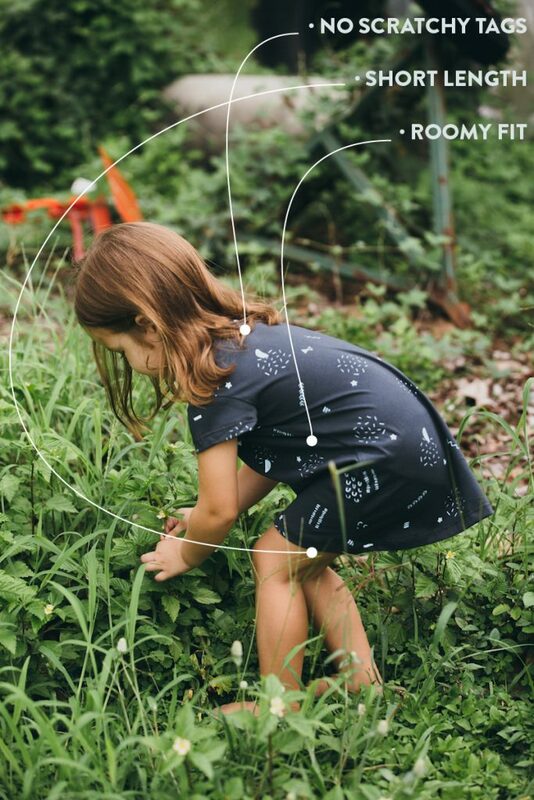 This intentional design feature means the shorts can be worn longer and also help them stay up on kiddos of the string bean variety. Our tiny models are wearing the shorts two ways. On the right, Little Miss 3 is wearing size 2 for a slightly more snug fit. On the left, Little Mr 3 is wearing size 3 rolled over at the waistband. You can shop the Slouch Shorts HERE. There’s a few special hidden qualities about the Tee Dress that you can’t see at first glance. Like all of the current collection, the Tee Dress is made from GOTS certified organic cotton, right here in Australia. We are always thinking about how your little ones grow and develop. 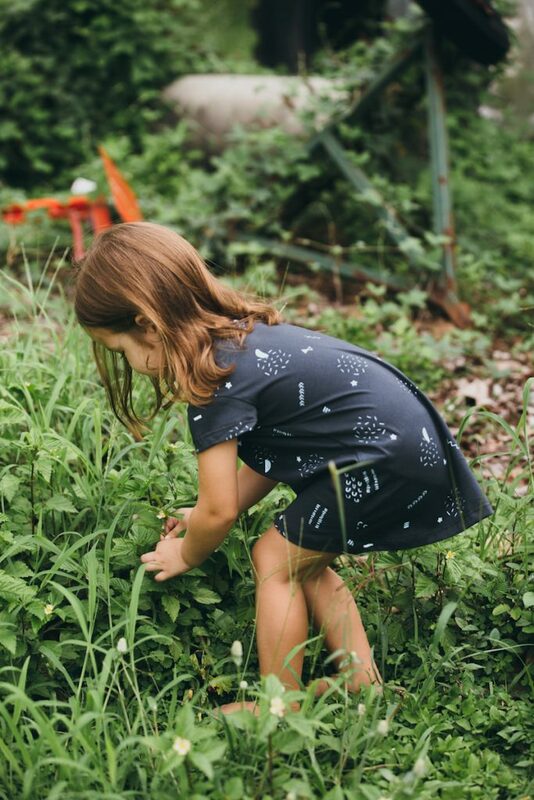 We want your tiny kiddos feel comfy in their clothes so they can spend their days playing and exploring. We tread lightly and minimise waste. Our clothes made by workers who are paid a living wage (not to be confused with a minimum wage!). and who’s rights and quality of life are respected and valued. All of the garments have a silk screened size and care label printed directly onto it. This makes sure there’s no itchy, scratchy, irritating tags annoying your little one during their day. The Tee Dress is a length that is not too short, but not too long either. Little legs should be free to roam and the length makes sure no toes or knees get caught in hems while playing. 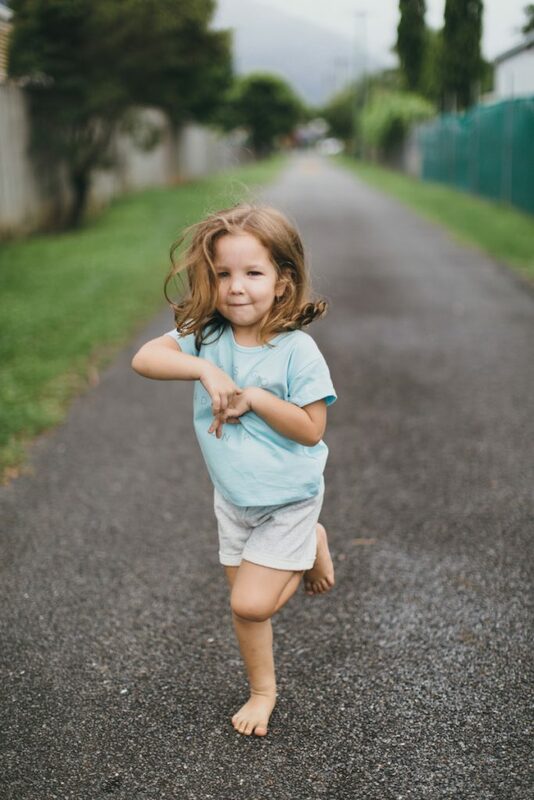 The roomy fit has just enough ease and flair in the hem to allow for twirling without swathes of fabric waiting to trip up tiny lady kiddos as they climb and play. 5 activities for toddlers that are quick and easy! Try these 5 activities for toddlers using what you already have in your kitchen! All of these activities for toddlers promote and encourage the development of fine motor skills and/or strength in tiny hands. Fine motor skills are what you use to manipulate drawing or writing implements, utensils and tools. Even though the start of their school journey is years away, (and I personally believe you should ignore that looming deadline for as long as possible! ), encouraging your child to use and develop their fine motor skills is a non intrusive way of helping prepare them. 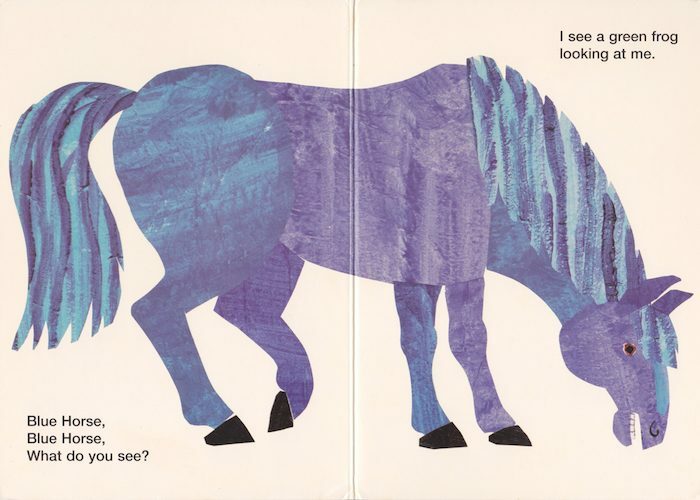 It can be physically uncomfortable, even painful for some little ones, so, as with any new skill your child learns, go slowly and follow their lead. 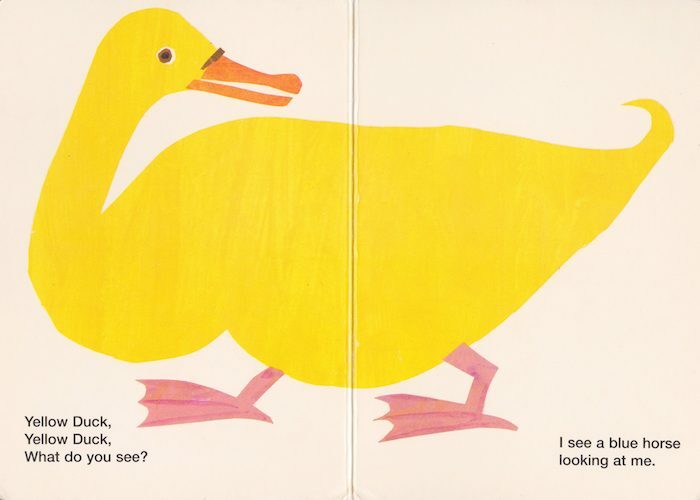 Does your little one need some quiet, focused time? Let them thread pasta on a piece of string. Rotelle or penne pasta are ideal for this activity, and it’s worth letting tiny hands experience using both. One is long and narrow, the other is short, fat & round. They’ll need to hold each type differently, engaging different muscles. You can also let them thread pasta onto different objects – straws, pipe cleaners even strands of spaghetti. Threading activities like these help promote fine motor skills and threading onto different objects will let them experience the different levels of force or strength required. Give them a bowl of rice or flour and let them play! Let them run their fingers through it, experience how it feels if you squeeze it or pour it from one hand to the other. 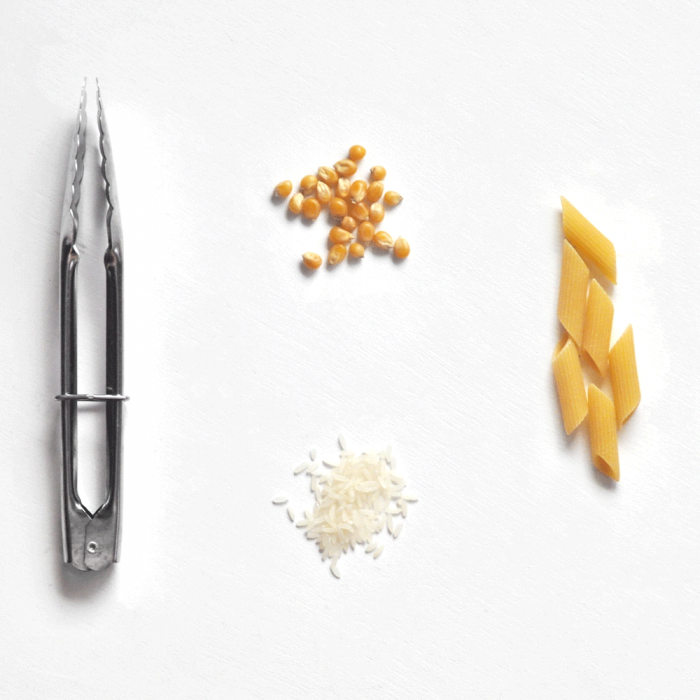 You can even combine a few of these activities together and have your little one use mini tongs to pick up dry pasta out of a bowl of flour or rice. 5. Chop up a banana! Encourage your little one to help prepare their snack by letting them cut up a banana with a butter knife. One quick and easy activity, so many benefits! An activity like this fosters independence, develops positive self esteem, self worth and self reliance, on top of building strength and fine motor skills. 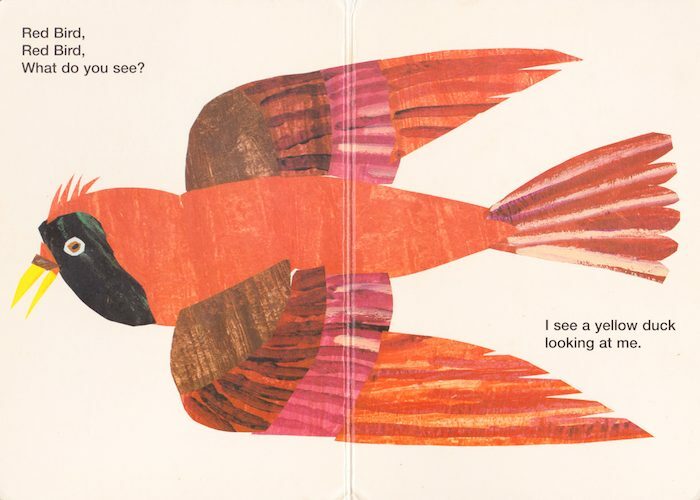 It allows your toddler to see themselves as capable and a valued member of the family who has skills and abilities that are useful and appreciated. Extend this activity by letting them try other foods – cooked sweet potato, kiwi fruit, pear, etc, will all have a different texture for them to experience, as well as letting them feel the differing amounts of pressure and strength they’ll need to use. Here at The Smallest Tribe HQ, we are always thinking about how your little ones grow and develop when designing each collection. We help your tiny kiddos feel comfy in their clothes so they can spend their days playing and exploring. We don’t want them worrying about scratchy tags or hems that try to trip them up. You can find the current collection HERE.